Panther Logistics specialises in transport, distribution, logistics and warehousing. With its modern fleet, the delivery company provides two-man, next day services for parcels, pallets and artic loads. Panther also offers same day service and more economic options, including 48- and 72-hour distribution services. It also offers white glove delivery services. Tracking of all consignments is possible, regardless of which partner is handling the shipment in the UK or throughout Europe. Panther uses a ‘best in class’ track and trace system with full GPS tracking and real-time reporting. All vehicles are installed with GPS tracking systems, which are used to not only track and trace items but also assess performance in terms of usage and fuel consumption. The online tracking tool is only available to Panther’s customers and is, as of August 2014, not available on www.panthergroup.co.uk. Registered as Panther Warehousing PLC, Panther Logistics was founded in 1989. The company is also known as the Panther Group. The company is a member of the United Kingdom Warehousing Association (UKWA), the UK’s only trade association serving the warehousing and logistics sector. Panther provides business customers with transport, logistics and warehousing services based on individual requirements. The company also provides business-to-consumer and business-to-business delivery services, including a two-man white glove service with deliveries to rooms of choice and value-added delivery assistance services. Panther Logistics is based in Crick, close to Junction 18 of the M1 motorway in central England. The company’s warehouse and storage facility provides businesses with a customised warehouse management system (WMS) solution for stock management. The facility is capable of handling all logistics solutions and storage needs with approximately 50,000 square feet of floorspace. A dedicated marshalling and pick/pack area and covered bays also ensure products are handled professionally and efficiently. Panther provides comprehensive delivery services, including bespoke solutions for businesses. The logistics company also offers distribution, storage, pick and pack, and consolidation services for its customers. Panther also provides a returns management service. Panther specialises in white glove service transportation with next day delivery throughout the United Kingdom. Panther’s two-man white glove delivery service includes delivery of a product to a specific location at the destination. It also includes unpacking, installation and full assembly. Other delivery assistance services include removal and disposal of packaging and old items as well as cleaning when required. Panther’s two-man delivery service can also be customised to meet individual needs of business customers. Panther handles white and brown goods, as well as sports and fitness equipment, flat pack products and a range of other items. Delivery teams are uniformed and are equipped with blankets, show covers and gloves. The service includes one-hour advance contact to inform recipients that the delivery team is en route to the delivery or collection point. In addition to business-to-consumer deliveries, the service is also available for business-to-business deliveries. Next day, two-man delivery is available to most addresses in England, Wales and Southern Scotland. Additional delivery services include three- or four-man teams to handle larger consignments. For all deliveries, Panther provides live online tracking updates. Customers also have access to a dedicated call centre. The company also provides a returned goods management service. Panther acts as an extension of their customers’ transport, logistics and warehousing operations. Part of this service includes comprehensive distribution solutions that bridges in-house and networked facilities with partner couriers such as DHL. Solutions are catered to a customer’s unique requirements. 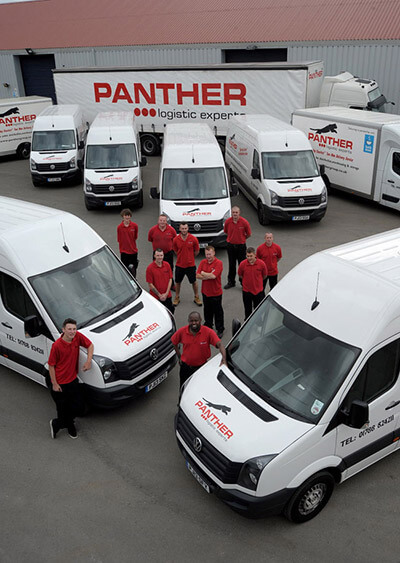 Panther Logistics provides UK distribution as well as distribution throughout Europe. Customers also have access to parcel and pallet networks, and all commodities are handled by Panther. Panther handles freight and oversized pallets, as well as part and full loads including small pallets and consignments. Distribution services provided by Panther include pallet deliveries, express pallet distribution, and next day pallet delivery and collection services throughout the United Kingdom. Next day pallet distribution is available to most addresses in England, Wales, Southern Scotland and Ireland. The company also provides 48-hour pallet distribution and tail lift deliveries throughout the UK. Same day delivery is also available for urgent consignments, while timed deliveries are offered for less urgent deliveries. Panther Logistics provides collection services from any location in the United Kingdom for onward distribution. Saturday delivery and collection is also offered. Daily departures to mainland Europe means that Panther provides flexible transport solutions for importing and exporting to or from Europe. The company’s distribution network includes a range of partners with more than 180 distribution centres in 25 countries. In addition to distribution solutions, Panther Logistics provides dedicated and shared warehouse space for business customers. The company’s central warehouse in Crick features a computerized warehouse management system and over 20,000 pallet locations, 60,000 racked pallet spaces, 4,000 Lin Bin locations for smaller items. The warehouse also features 20,000 square feet of handling space, covered bays and two dock loaders. The company’s secure warehouse is located close to the M1 and M6 motorways. The facility features an advanced alarm system and CCTV, as well as 24-hour security. It is also operated by trained warehouse operatives. The warehouse features the latest packaging system, including a Lantech stretch wrapping machine and Airspeed packaging system. The company provides made-to-measure boxes and packaging through. Also known as groupage services, consolidation refers to the combining of different items into a single shipment for delivery. The service is an ideal solution for businesses interested in saving on freight costs. Panther provides cost-effective consolidation services for customers worldwide. The service is designed especially for palletised and loose-loaded shipments. As part of the service, Panther offers door-to-door collection and delivery, tracking, customs brokerage and declarations, cargo inspection, quality control and sorting. Panther’s Pick and Pack service is available as a stand-alone option or as part of a broader solution that includes other Panther services. With this service, Panther takes care of all the preparation and packaging of a business’s products for delivery. Pick and pack services include unloading and discharging containers, loading cartons onto pallets, picking up items from pallets or boxes, and re-boxing and re-labelling items. Other services including re-packaging, sorting items and preparing documentation before shipping items. Panther will also prepare items for collection or delivery, as well as handle returns and liaise with carriers. Panther handles customer returns and the transport of obsolete products as part of its returns management service. The company delivers full reverse logistics solutions and a secure returns area for sorting at its main hub. The service is designed to help businesses maximise their total asset recovery and promote better customer services. The returns management service is typically used for returning high-value items and larger items, including white goods. It is also used to recover obsolete and non-operational goods or parts when delivering new or replacement items. Panther’s returns service includes receiving, sorting, verifying and managing all returned products. Delivery teams will also uninstall goods at the recipient’s location before returning items. With such a comprehensive set of delivery options, it’s important that price is tailored specifically to each individual shipment. Panther will respond to an inquiry with an initial quote along with various options to buy-up or buy-down. This can be revised any number of times until both parties are satisfied that the service agreed on will meet the specific needs of this shipment. Panther guarantee with True Transit, True Pricing that no hidden costs will emerge so that the agreed quote will always match the invoice. Time – Panther are obsessive about on-time delivery, to the extent that they measure service within 15 minutes of promised pick-up and delivery times. With a current success rate of over 98.5%, clients can be sure that Panther will be in the right place at the right time to tend to their delivery needs. Service Options – Panther is an extremely large company and therefore, the services it can offer are extensive. Panther’s portfolio will find a solution to even the most challenging of transportation needs. Ease – Panther always arrange pick-ups and deliveries, handle any customs requirements, and manage all of the documentation. With all corners covered, using Panther really couldn’t be simpler. Experience and Expertise – Panther has been working with door-to-door deliveries for over two decades and has experience in dealing with shipments of all kinds. The company is made up of experts from all kinds of industries so that there will always be an employee on board who understands your specific needs. Areas of expertise lie in government, defense, automotive, manufacturing, life sciences, and chemicals and energy. Safety – Panther takes safety very seriously and has put numerous procedures in place to ensure that their clients’ goods are always left in safe hands. Tracking – For peace of mind, Panther has developed a tracking service which can be accessed from any computer or smartphone and can offer information on location and condition of any shipment at any given time. Technology – Panther uses sophisticated equipment and technology across all modes of transport to cater for all needs. For example, Panther can offer temperature validated shipments for pharmaceutical manufacturers, and high-security arms, ammunition and explosives moves. Costs – Panther prides itself in offering the best service for affordable costs which are always tailored to a client’s specific needs. The procedure is fully transparent meaning that there are never any hidden fees and the invoice always matches the quote. Panther hires both operational and head office positions, including collection and delivery team members and customer services representatives. For more information about employment opportunities, contact the company’s human resources department by completing the online form on Panther’s website. Panther Logistics can be contacted by writing to Panther Warehousing PLC, Crick Road, Crick, CV23 0AB, United Kingdom. General enquiries may be directed to 01788 823 656, while customer service enquires should be directed to 01788 823 656.
it was arranged on monday 31st october by a phone call from your company to arrange my delivery for 2nd november in which i only received half the bed this is very unexceptable as i took time of work to received the order. on calling the office yesterday was inform my order would not be delivered until monday 7th nov, then was informed it can be arranged to go out manually for delivery today 3rd nov in which i have not received anything. this is yet another day off. the service im receiving is very poor. i want to know when i will received my delivery as will have to take yet another day off that will be 3 days money i have lost due to your bad delivery service and organisation. why only send half the order??? what you going to do about the time i have had to lose. i paid for this item last week 26th was told by wayfair its a 2 day turn around for delivery not nearly 2 weeks. you have took the money for an item i have not received yet. I was informed that my order through Amazon via Limitless Base would be delivered today 1st July. It has not! Please can you inform me when delivery will be made. I have stayed in all day today but I can’t stay in all day every day. Please could the following items (delivery Friday 1 July) please be scheduled for an AM? We have ordered a mattress from Silent Night, order number 16124953 but do not have a tracking number. We where informed that we would receive a 4 hour delivery slot the day before the delivery date, we not received this. We are expecting delivery today and need to have an idea of the time for this delivery. I was wondering when my top I ordered from physiq apparel on Saturday will be getting delivered. Tracking number 377686225 – Please advise whereabouts and delivery for this item. Groupon, from whom it was purchased, advise that it was despatched on 26th January ! I have a tracking number for delivery of a mattress with you. 376805987. This delivery is way overdue the expected delivery date. Do you have any information on the whereabouts of the order? I cannot contact the merchant directly. When you receive the order can you contact me with an expected delivery date? its a large order so I need warning when it may arrive. Can you link this email to the tracking number so that it pops up to inform anyone processing my order that it is well overdue and I would like to be contacted? can you tell me who the merchant is? I don’t wish to make a complaint, wanted to inform the company that they are employing an illegal immigrant by the name of Edwin Nyadzayo,who is currently on a Ban from driving and does not hold a current UK working permit. I have tried to call but never seem to get through. I will be contacting the immigration office myself. The tracking link above is incorrect, pointing at Panther Premium Logistics which is in North America. Excellent service, delivery on behalf of Scott’s and co, two very helpful guys from Leeds. I have a very large parcel due for delivery on Friday 27th November. I wonder if I can delay it until Monday 30th? All arrangements need to be made directly with Panther. I would like to request for quotation for moving out the furniture’s from 3rd Floor with lift access from this address at The Warehouse (address hidden) London. Accordingly, could you give me your best price offer & how many days it will reach to London.